The Class of 2019 learned from past LC graduates as well as current community leaders. Leadership Clinton grad Jonathan McKay leads the Class of 2019 at the cemetery. 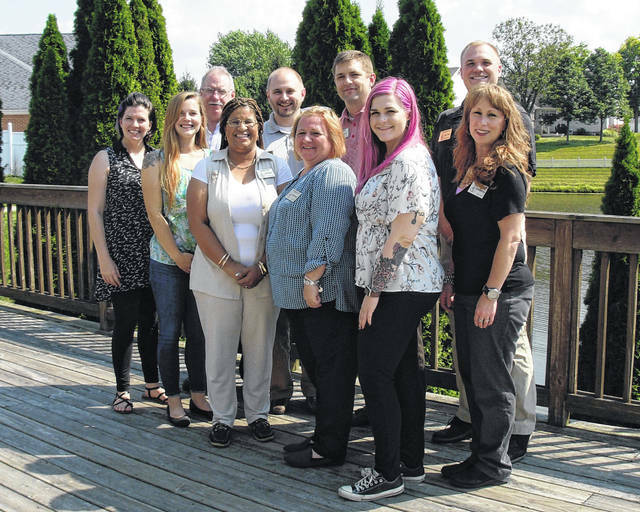 At Ohio Living Cape May are members of the Leadership Clinton Class of 2019, from left: front, Marian Miller, Emily Osborne, Jeanne Pope, Melissa Puckett, Susannah Haines and Shannon McGowan; and, back, Brady Stevens, Joshua Martin, Lance Beus and Dalton Wood. For more photos of the class’ day, visit wnewsj.com. WILMINGTON — Leadership Clinton’s Class 32 joined together at the Wilmington Public Library in September to speak with Library Director Joe Knueven on the history, and new and upcoming construction, happening at the library. The class received a tour and learned when the library was founded and all the renovations and changes coming to help make things more accessible to the community. After a wonderful history lesson and tour, the class had the chance to network with Matt Wahrhaftig and Eric Guindon, both 2018 Leadership Clinton graduates, and learn about past projects and where they are now today after graduating, and where their projects still stand. “It’s important to learn where you can be effective to the community and have an everlasting impact,” Eric said. Class 32 also stopped by Wilmington College Cultural Arts Center to speak with Tanya Snarr, Stephanie Stokes and Tara Lydy on the importance on setting the stage for your class. They gave us great insight on where their classes began to where they are now and the impact they had on one another’s lives. Oho Living Cape May provided lunch for Leadership Clinton future graduates and past graduates, including Eleanor Harris, Jeff Murphy, Terry Habermehl, Jonathon McKay and Mike McCarty, Republican candidate for county commissioner. The past grads gave insight on how to be a good board member,and on learning from nonprofit leaders and other staff and board members. Class 32 and past leaders had deep discussions on learning from community government leaders and how they got to where they are, and what becoming a Leadership Clinton member did to help benefit them and the community. 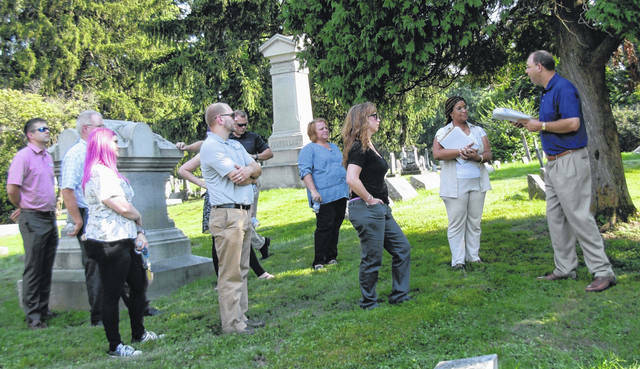 Heading to Sugar Grove Cemetery, the class learned about the “Ghost of Leaderships Past” from Jonathan McKay. Only preparing class 32 to get motivated and excited to be part of such a great community and play our part. https://www.wnewsj.com/wp-content/uploads/sites/22/2018/10/web1_LC4-1.jpgThe Class of 2019 learned from past LC graduates as well as current community leaders. https://www.wnewsj.com/wp-content/uploads/sites/22/2018/10/web1_LC1-1.jpgLeadership Clinton grad Jonathan McKay leads the Class of 2019 at the cemetery. https://www.wnewsj.com/wp-content/uploads/sites/22/2018/10/web1_LC2-1.jpgThe Class of 2019 learned from past LC graduates as well as current community leaders. https://www.wnewsj.com/wp-content/uploads/sites/22/2018/10/web1_LC3-1.jpgAt Ohio Living Cape May are members of the Leadership Clinton Class of 2019, from left: front, Marian Miller, Emily Osborne, Jeanne Pope, Melissa Puckett, Susannah Haines and Shannon McGowan; and, back, Brady Stevens, Joshua Martin, Lance Beus and Dalton Wood. For more photos of the class’ day, visit wnewsj.com.